Traveling of any kind is always a grand adventure. I work from the premise that the more you know about your destination the more you will enjoy your trip. But how does one learn to prepare adequately and then actually travel on one’s own? For Allegheny students, one way to start is the Allegheny College Center for Experiential Learning (ACCEL) travel seminars. Over the past few years, students have been able to choose seminars going to such destinations as China, the Czech Republic, Fiji, Germany, Greece, London, New York City, Paris, Poland, South Africa, Ukraine, and Yellowstone National Park. In May 2004 economics professor Antoni Moskwa and I took a group of nineteen students on a three-week ACCEL travel seminar titled “Traveling in the Liberal Arts Tradition: Berlin, Leipzig, Warsaw, and Prague.” In Germany, Peter Ensberg of Allegheny’s modern and classical languages department helped coordinate and lead the trip. Also, for the six days in Germany, we had the distinct pleasure of having President Richard Cook and his wife, Terry Lahti, travel with us. They participated in every one of the group activities and established some lasting friendships with students and faculty alike—and, as detailed shortly, Dr. Cook was of great help when the group arrived at Großbothen. So what does it mean to travel in the liberal arts tradition? One of the goals of the ACCEL program is to promote international pro- grams that foster cross- cultural and global aware- ness. As much as possible we wanted this awareness to be informed by the students’ own knowledge of, exper- ience in, and approach to the liberal arts. The group was about evenly split between science and social science majors, with nearly half minoring in humanities such as music, English, or a language. 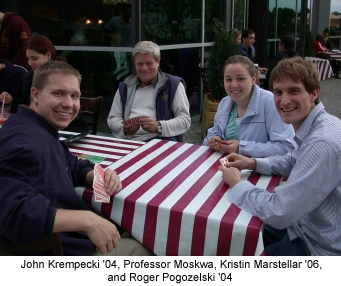 Several students had Polish or German connections, and about a third were familiar with one of those languages. We wanted to take advantage of the large spread of expertise that was represented in our group—to be mutually informed by our liberal arts studies and experiences. Professor Moskwa and I led the seminar in the mornings for the four on-campus days, dealing with such topics as European geography, basic economics, different cultural expectations, and elementary Polish, as well as elements and the periodic table, catalysts, X-rays, radioactivity, and the discovery of fission. In the afternoons students prepared for their talks and papers. Each student was expected to present two talks to the group at an appropriate juncture during the trip and then turn in an accompanying paper two weeks after return to the States. Through their talks and papers, students researched and then helped their professors and colleagues understand a variety of topics: the history of the atomic concept and the development of the periodic table; the lives and times of scientists such as Marie Curie and Emil Fischer; comparative economic, political, and educational systems of Germany, Poland, and the Czech Republic; short biographies of Johann Bach, Beethoven, and other composers whose music we enjoyed during three concerts we attended as part of the trip; selected topics involving the history of Berlin, Wroclaw, Krakow, Prague, and Warsaw; and the history and the future of the European Union. These talks were among the highlights of the trip. No one will forget David Iberkleid ’05 jumping out of our coach at the Poland-Germany border and explaining, using his pre-prepared maps, why the border had moved a number of times throughout history. Equally memorable was Colleen Zink ’07 explaining the synthesis, structure, industrial preparation, effects, and mode of delivery of Zyklon B gas. I will never forget the look on the group’s faces when we encountered a display of thousands of empty cans of Zyklon B at Auschwitz. Memorable too was Kim Lorenz ’06 as she stood at the base of the statue of Emil Fischer at the Max Planck Institute and explained the chemistry that led to his 1902 Nobel Prize, or Roger Pogozelski ’04 talking about the history of Wroclaw as we looked down on the city after lunch in a small restaurant atop the tallest building in the city. His proud uncle, who had joined the group for several hours, stood in the background listening to his talk. Then there was Cole Maxwell ’06, who presented data comparing the economies of the three countries as our coach to Warsaw plied the dusk of an early summer evening. 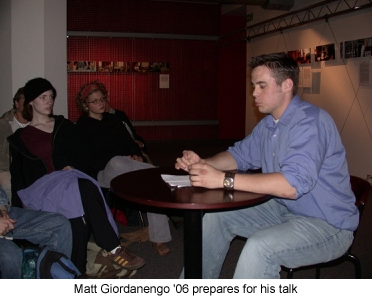 I will never forget him fielding a mind-boggling array of questions from the group, science and social science majors alike. Finally there was Derek Golna ’07, a chemistry major, giving a talk on Frédéric Chopin immediately after a wonderful live concert of his music in the shadow of the grand Chopin Monument at Lazienki Park in Warsaw. A particular highlight of our trip was a visit to “Energy House,” the estate of Wilhelm Ostwald, 1909 Nobel Prize winner in chemistry. That visit was also exemplary of “scientific traveling,” which can be defined as travel with an emphasis on sites related to the history of science. I have been fortunate enough to make five scientific traveling trips in the last seven years, and three of these trips have been directly related to the ACCEL program. So what happened when this well-informed and inquisitive group arrived in Großbothen, home of Wilhelm Ostwald’s “Energy House” and the conference center now housed there? Ostwald’s great-granddaughter, Anna Elisabeth Hansel, was animated and enthusiastic as she took us through the house and showed us his Nobel Prize certificates, homemade laboratory equipment, paintings, various examples of his color system, and the organization of his correspondence, which totals over 45,000 pieces. Anna does not speak English, however, and so we needed interpreters. Dr. Ensberg, with some help from me on the science parts, took one group. 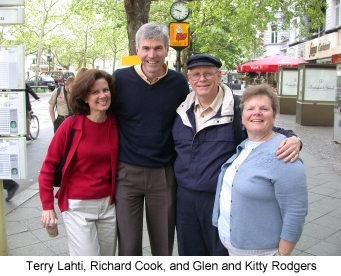 Dr. Cook—who is fluent in German from his many trips there and, of course, was a chemist in his former life—did admirably with the other group, according to student reports. Because we were fully informed about Wilhelm Ostwald and his achievements before we arrived, our encounter with the Energy House and the people we met there was that much more meaningful. During our time there, we noticed that there was not one American sponsor of this unique scientific traveling site. Knowing that the house and conference center are desperately in need of financial support, Dr. Cook arranged for Allegheny College to become a sponsor. If you go there, look for our plaque as you enter the Energy House. And when you travel, think about Allegheny students traveling in the liberal arts tradition.